I would not call these as resolutions. But I would definitely call these as my "Aasaigal". I have always failed to follow NewYear resolutions and hence I stopped making them. These are my plans for 2015. If everything goes well, I will be happy. 2) Publish my book (I have three titles in mind) by the end of the year. I have been saying this from 2008 onwards. If only I had published my book in 2008, things would have been different now. 3) Finalise on one of my talents and move forward. I have been a jack of few trades and I have always been doing many things at one time. As a result, I have not made progress in any of the talents bestowed upon me. 4) Publish 3 spiritual books on Christianity by the end of the year. I am working on the first book. 5) Go on a backpack trip to North East India and record my memories as a photo story book. 6) Regain the humour that I lost some years ago. 8) Become more organised and disciplined. Get up early and sleep early. 9) Stay away from FB and my phone for at least 2 hours in a day when I am awake. 10) Take part in keeping my home clean and my neighbourhood clean too. I have joined a group called Chitlapakkam Rising. I am planning to invest my time and effort in this group. 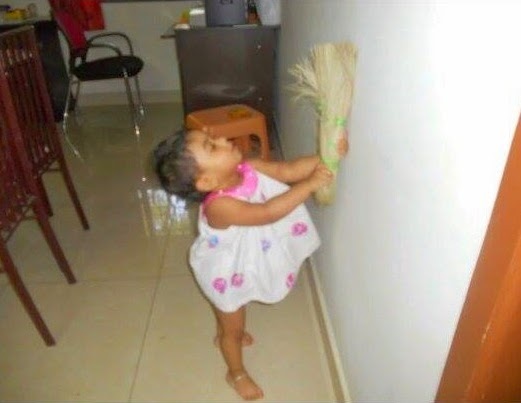 That's my daughter Anya cleaning the house.She is not taking part in any Swachh Bharat acting program. 699. Has Pongal lost its favour? 695. What should we do with Arnab Gowsami?